Today’s society consists around social media as almost the entire world population has a smartphone or some type of access to the internet. Many would argue that we’re living in a digital world constantly surrounded by distractions. Although these distractions are attributed to the constant “bad habit” of checking our social news feed, it’s a bad habit our society isn’t going to shake. Social Media is apart of our world. Teenagers are all over Social Media; there is no denying this. Give a teenager a smartphone or a laptop and they will have some type of social profile within minutes. “71% of teenagers in America engage on more than one social media network site,” Facebook, Twitter,and Instagram being in the top 5. Why shouldn’t adults be the same to some extent? Besides from the distractions, the ability to communicate and receive information at the click of a button can benefit parents who struggle to keep up with their tech savvy children. Online learning advancements have been developed over the years, such as Blackboard, Moodle, and others, to encourage students to direct their online use toward educational programs. Social media on the other hand is still a trending network slowly, but surely being utilized by more and more school districts across the country. Teachers are creating Facebook pages to stay in contact with not only their students but parents as well. This medium of communication outside the classroom benefits well when it’s time to post homework, answer questions, or even generate discussion among students and parents over a current event. Another social network highly being utilized is Twitter. Twitter is an online news and social networking service where users post and interact with messages, known as “tweets,” while being restricted to 140 characters. 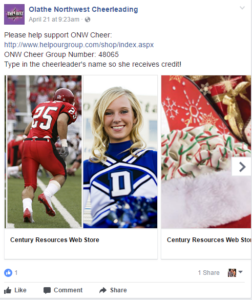 This platform is best utilized as a new alert, such as a high school game alert, student/teacher recognition, and school news updates such as upcoming school fundraisers. 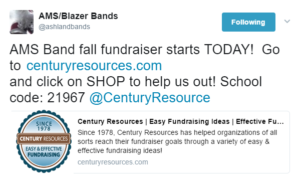 Ready to start your next fundraiser? Click here to get started!